Nothing better shows the transformation of the land of Israel since A.D. 70 than the fact that when Jerusalem was captured by the Persians it was the Christians, not the Jews, who sang a lament over the Holy City. As the Sassanid forces made their way through the cities and towns of Palestine, a new wave of messianic fervor broke out among the Jews, who welcomed the invaders and offered them support. But by the seventh century, Christians throughout the Roman Empire identified with Jerusalem and its fate. When John the Almsgiver, patriarch of Alexandria in Egypt, heard that the Persians had ravaged the Holy City, “He sat down and made lament just as though he had been an inhabitant of the city.” Jerusalem's fall reverberated across the Christian world. Strategos, a monk of the monastery of Sabas, wrote an eyewitness account of the Persian invasion. He described the seizure of the holy cross, the capture and deportation of the patriarch Zachariah, and the sack of the city. He also related stories of valiant Christians who stood firm in the face of adversity, such as a deacon who saw his two daughters cut down by the Persians because they would not “worship fire.” The Persians pillaged and killed women, children, and priests. “And the Jerusalem above wept over the Jerusalem below,” Strategos wrote. What kind of lament should I offer you? For Sophronius, as for other Christians of his time, the earthly Jerusalem had taken on the qualities of the heavenly city. “Zion,” Sophronius wrote, was “the radiant sun of the universe.” These laments over Jerusalem sum up the beliefs and attitudes that had been developing for centuries. That “holy Jerusalem” would be “laid waste” brought to the surface feelings that few Christians fully understood. The Sassanid occupation of Jerusalem was a temporary interruption of Christian rule. The Byzantine emperor Heraclius launched an unexpected counteroffensive through Armenia and northern Syria directed at Persia itself. Chosroe II had just died, and the Sassanids sued for peace. By the spring of 629, Heraclius reached Palestine, returning the most sacred relic of Christianity, the holy cross. In March of that year he entered Jerusalem in triumph. Yet the victory, through real, was short-lived. In less than a decade, Muslim armies would be at the gates of the city. When the Muslim armies streamed into Palestine in the summer of 634, they struck first in the vicinity of Gaza on the Mediterranean coast. Once they had gained the loyalty of local Arabic-speaking tribesmen living in the deserts, they began to lay siege to the cities. Again and again, the emperor's troops were forced to retreat. Though the Byzantines outnumbered the Muslim forces by as much as four to one, the Roman armies were no match for these fervent warriors from the desert. When the Muslims routed the emperor's legions at the Yarmuk River, a small tributary that runs into the Jordan River south of the Sea of Galilee, the way was open to Jerusalem and Caesarea. It had long been the custom (and still is today) for the Christians in Jerusalem to celebrate the Feast of the Nativity with a solemn procession from Jerusalem to Bethlehem. In 638, with the invaders camped outside Jerusalem, the aged Sophronius and the rest of the faithful celebrated Christmas huddled behind the walls of the city. Only two decades after Zachariah was taken captive by the Sassanids, Sophronius watched helplessly as invaders again swept across the Holy Land. To him was assigned the unhappy task of negotiating a treaty with Caliph Umar, the Muslim conquerer of Jerusalem. The meeting between the representative of the Christian Roman civilization and the general of the new religion from Arabia was so filled with drama and historical significance that several detailed accounts have come down to us. According to a Christian chronicler writing in Egypt in the 10th century, the caliph and his companions sat in the courtyard of the Church of the Holy Sepulchre. When it came time for prayer, he said to Sophronius, “I wish to pray.” Sophronius led him into the church and laid a mat down for him, but Umar refused to pray there and instead went out and prayed alone on the eastern steps of the church. He said, “Do you understand, O patriarch, why I did not pray within the church? … If I had prayed in the church it would be ruined for you. For it would be taken from your hands and after I am gone the Muslims would seize it saying, 'Umar prayed here. '” Umar then wrote a document forbidding the Muslims to pray in that church. In return, he asked Sophronius for a place to build a mosque, and Sophronius led him to a rock on the Temple Mount where God had spoken to Jacob, and which Jews had called the “holy of holies.” Because of Jesus' prophecies about the destruction of the Temple, Christians had never built a church there. According to Muslim accounts of this story, Umar wanted a mosque to be built on the site of Solomon's Temple, which had been destroyed by Nebuchadnezzar. The Muslims venerated Jerusalem as the city of Abraham, Jesus, and other prophets mentioned in the Quran. The Arab conquerors of the Holy Land were not simply belligerents; they were the vanguard of a new religion that made a spiritual as well as a political claim on Jerusalem. The commanders of their armies were harbingers of a new civilization that would displace the language, transform the institutions, remake the architecture, and convert much of the population in a region that had been dominated for a thousand years by the cultures of Israel, Greece, Rome, and Christianity. In his Christmas sermon in 638, Sophronius cast the Muslim invasion in the same terms that Christians had used to interpret the Persians: The Arabs were God's instruments to chastise Christians for their sins, and in time the invaders would be driven from the Holy Land. But with the arrival of Muhammad's armies and the swift establishment of Arab hegemony in the region, Christian rule in Jerusalem came to end, decisively and definitively. Like the Jews before them, some Christians began to hope for a Messiah-like deliverer who would drive out the “godless Saracens” and restore the “kingdom of the Christians” to Jerusalem. His coming would inaugurate a great age of peace and prosperity in Palestine and prepare the way for the final triumph over evil and for the reign of Christ. Though such hopes were disappointed, the idea of a Christian Holy Land did not perish. In the generations immediately after the Muslim conquest, seeds were already sown that would sprout 400 years later in the Crusades. Christianity was not a passing phenomenon in the history of the Holy Land. Christians began to adopt Arabic, the language of the conquerors, as a language for Christian worship and scholarship. They began to make the slow transition to a new culture and society shaped by the religion of Muhammad. Stones, however, do not speak, as this wise monk knew well. His little treatise is not simply a list of places, it is a catalog of churches—a testimony to the perseverance of Christian life in the Holy Land. Only people, not stones and earth and marble, can bear an authentic witness. 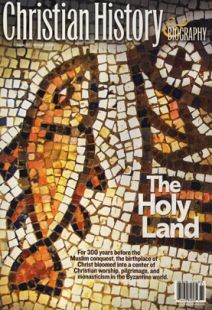 For Christians, the Holy Land is not simply an illustrious chapter in the Christian past. As Jerome wrote to his friend Paula in Rome, urging her to come and live in the Holy Land, “The whole mystery of our faith is native to this country and city.” No matter how many centuries have passed, no matter where the Christian religion has set down roots, Christians are wedded to the land that gave birth to Christ.